Arrow Type Packer Elements & Valve Seals | Global EEE, Inc.
Arrow-Type packer elements are rubber molded products that serve a number of purposes in specific down-hole activities. In the majority of instances, packer elements hold their position under differential pressure to create a reliable seal with liner walls and casings. They’re used in applications such as zone isolation, leak detection and well testing — to name just a few. Because of their versatility, Arrow-Type packer elements are heavily relied on to help keep well and rig areas operating smoothly and cleanly, which means they aid both your workers’ safety and your overall productivity. But of course, this can only happen if the packer elements you’re using are well-manufactured and cost-effective. Fortunately, at Global Elastomeric Products, Inc., we’ve been making packer elements and elastomeric products for the oil and gas industry for well over 50 years. Throughout that time, we’ve proudly served the equipment needs of the oilfield by molding high-quality products made from tear-resistant compounds. What’s more — we do it for competitive prices and with some of the fastest turnaround times in the industry. Packer elements are rubber seals that operate under specific down-hole conditions and provide a seal for either short-term or long-term completion. Global EEE has an expanding line of packer elements for your tool and well conditions. We have the knowledge, resources and ability to mold and manufacture any rubber compound - from traditional Nitrile and EPDM products, to your Viton’s, Aflas, FKM’s. 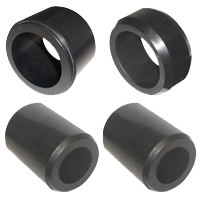 We're also well-versed in creating custom rubber elements to address your rubber replacement part needs. Call Global EEE at 661-831-5380 for your custom project and we can walk you through the design to manufacturing process. Because we’re an ISO 9001:2008-registered company, our quality control methods are some of the most stringent in the business. The bottom line is that whether you need standard or custom rubber molded products, when you choose us for your oilfield needs, you can count on receiving defect-free products — delivered when and where you need them. Want more info or a no-obligation quote on our Arrow-Type packer elements? Contact us today.